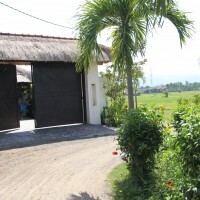 ..in our ‘Terang Bulan’ estate, for an unforgettable and luxury holiday in Bali with lots of privacy. This is a luxury 5 star estate for 2-6 people at the beach of Lokapaksa, near Seririt and west of Lovina, in the quiet north of Bali. 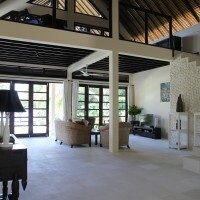 Villa Terang Bulang is built in 2009 on a plot of 3200 m2, lies in a lush tropical garden with waving palm trees, flourishing exotic plants and flowers, exquisite statues and lotus ponds, with a large private swimming pool and a lovely jacuzzi. 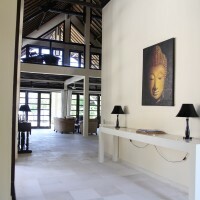 Next to the swimming pool an open lounge space (balé benong) on which you can relax, sleep or read a book. From our sitting space near the lava sand beach on the Bali sea shore you can enjoy the sunset. 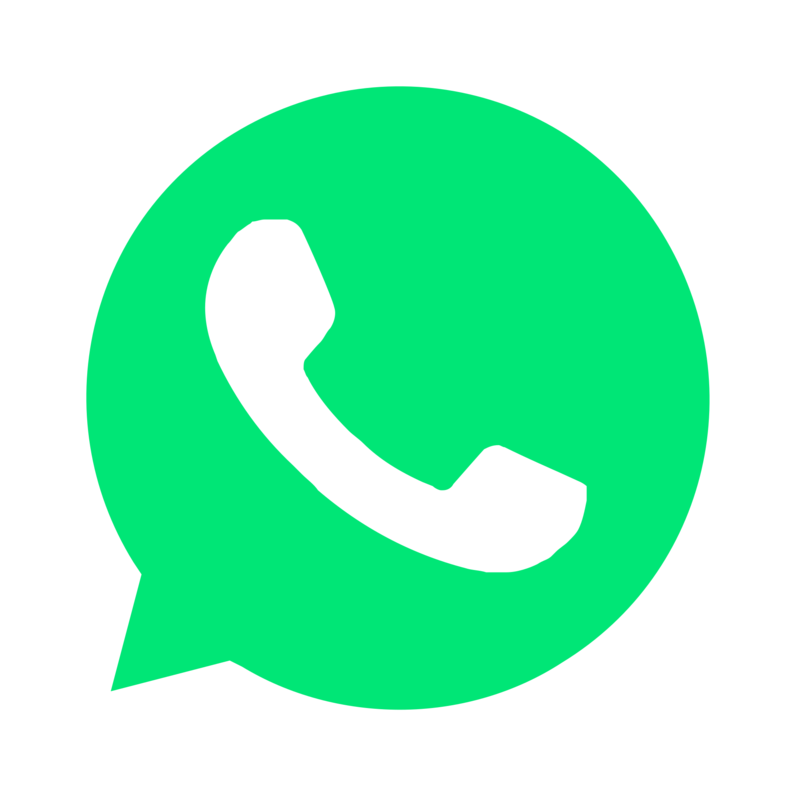 The house has an English speaking staff, ready to serve you 6 days per week: a housekeeper (pembantu), two gardeners for the outdoors and a security at night. 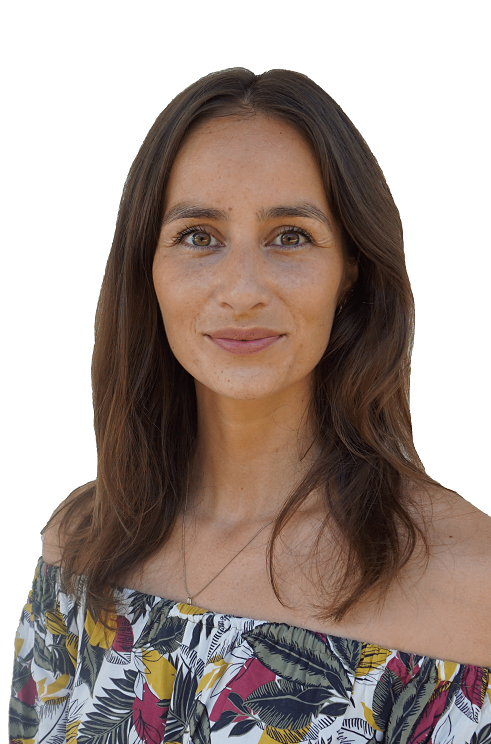 They will look after you during your stay. Via the spacious entrance hall with outlook on the beautiful alang-alang roofing you arrive in the stately living room of 8 x 7.5 meters with a full width view on the garden and sea. 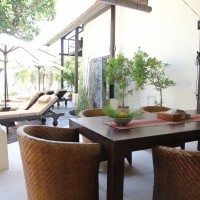 The style of furnishing and furniture is kept uniform and minimalistic with Balinese, Buddhist and colonial emphases. 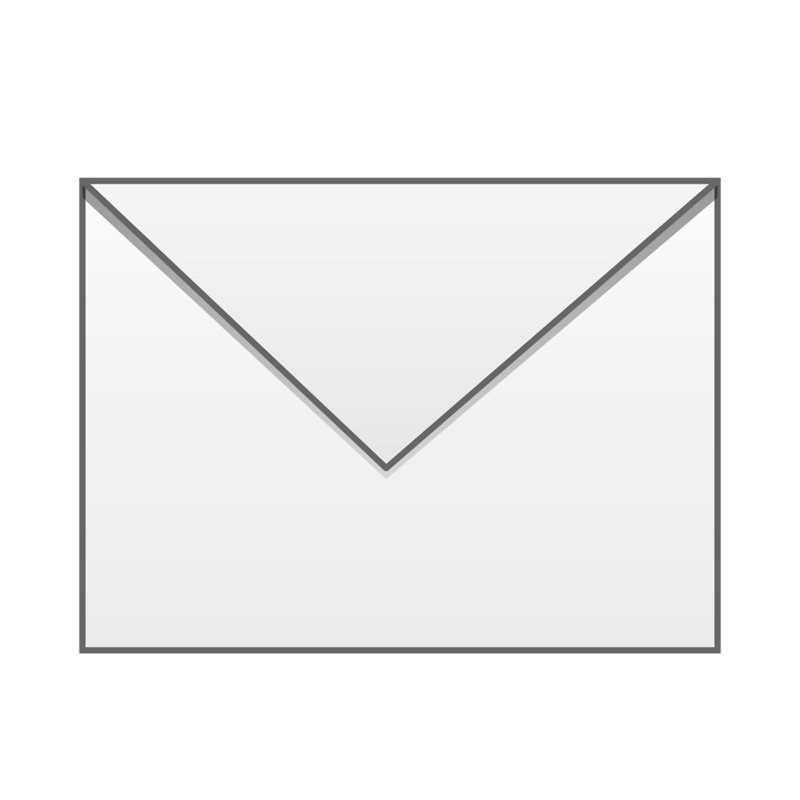 The facilities however are from this era with amongst other things: an LCD satellite TV, a wireless internet connection for your laptop or smart phone and a CD/DVD player. In the living, a flight of stairs leads to a void space sized 4 x 7.5 meters with a classical writing desk and a balcony of 3 x 7.5 meters for enjoyable moments of stay. 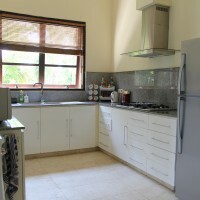 The kitchen is adjacent to the living room and has a hot & cold water dispenser. Behind the kitchen is a store room with an extra refrigerator for all of our drinks. 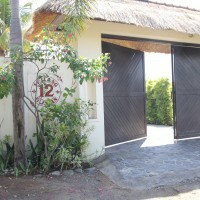 There are three bedrooms, all equipped with both a fan and an air conditioner. The master bedroom of 5 x 6.5 meters has a double bed, a promenade cabinet wall and a safe. Adjacent an “outdoor” bathroom for sumptuous showers in the open air with a double wash basin and a toilet. Next door is the 2nd bedroom of almost 5 x 6 meters with twin beds, a wash basin and an indoor shower. 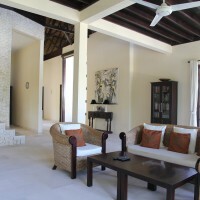 Both bedrooms have access to the veranda. The 3rd bedroom of 3.5 x 4.75 meters is situated at the front side of the house with a double bed and an ”outdoor” bathroom. 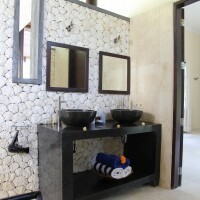 Obviously the estate has standard facilities such as cooking gaz, electricity, water supply and bath- and bed linnen. You enter into the premises via the big gate, into the carport with a garden barn and next to it the house temple. On the left side is a facility room for the staff with a washing machine and a dryer. The street leads you via the front garden and between ponds with sleeping Buddha heads to the front door. 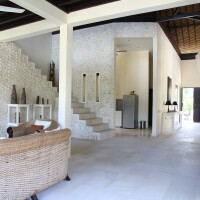 You enter the seaside garden via a sliding door in the hall to the roof covered veranda. This is where you spend the biggest part of your time at the large dinner table or in the settee or the chairs of the comfortable lounge suite under the two fans. The veranda is equipped with bamboo roller blinds if you prefer shade in the afternoon. Directly adjacent to the veranda you’ll find the large infinity swimming pool of 6 x 18 meters, custom built for real lovers of swimming tracks as it has an entry point in the corner and varies in depth between 1.40 and 2.00 meters, with two seats in the back. On the right side of the pool is a wooden platform with 6 deck chairs and 3 parasols and a water element. 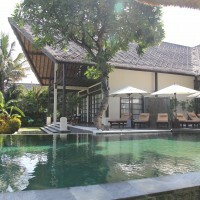 Next to the pool on the left the balé benong of 3 x 4 meters with a comfortable lounge mattress with cushions. Lying there in the shadow with a book and touched by a gentle sea breeze; most fall asleep within 5 minutes! There is also an outdoor shower to freshen up after your nap. From the terrace you enter the beautiful tropical garden. 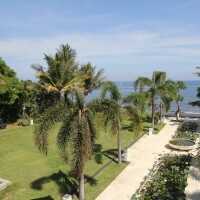 A wide avenue passes along the lotus ponds and Buddha statues that were made in situ by local artists and leads to the sitting space at the sea side, about 40 meters from the house. 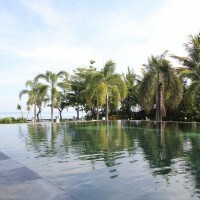 The veranda, the house the swimming pool and the jacuzzi are illuminated marvelously in the evenings. So, all ingredients are present for a fantastic experience on this ‘island of the Gods’!